Among the very many cooking shows on television I follow,Chakh le India occupies a prime position.Not only because of eye-candy,the show is interesting as the format is quite easy going,and I mean that in a good way.I was introduced to CLI by my co-sis Roopavanni who insisted I watch the show as Aditya Bal's recipes were easy,delicious and quick. She had tried out his recipe for Khandvi and it came out perfect each and every time.Considering Khandvi is not a very easy recipe to follow,I believed the show had some credibility after all. Aditya Bal is the host of the food based travel show Chakh le India on NDTV Good times.I received Aditya Bal's The Chak le India Cookbook as part of BlogAdda's book review program.The first thing I noticed(quite predictably)was the lack of vegetarian dishes.More than 70 recipes and hardly 15 vegetarian recipes!Some solace is the snack and dessert section which again has a few more vegetarian dishes. The section on India Pantry is quite informative and so is the detailed section on cooking techniques.Pictures though less are good but I thought excess Macro shots made some of the dishes quite unrecognizable. The recipes are from varied cuisines,ranging from Punjabi dishes like Dhabe ka Kheema to Bengali dishes like Aloo Posto and then heads South with Beetroot Pachadi,Moru Sambhar and Vendakkai Gojju. 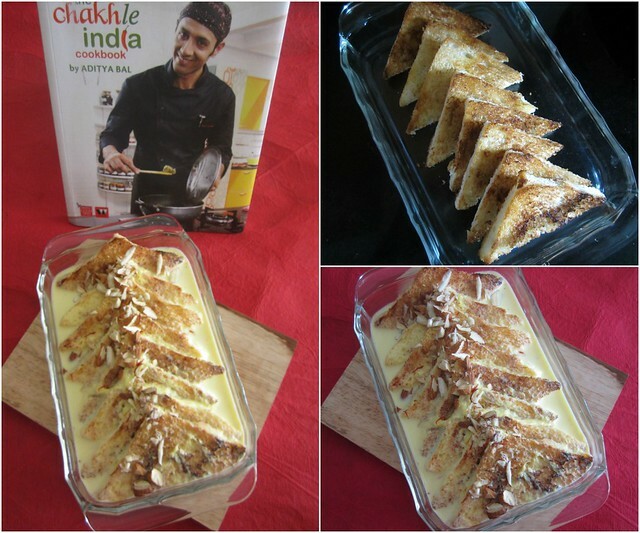 I chose to try out the recipe for Shahi Tukda as that is something I've been wanting to cook for sometime now.The recipe is quite simple to begin with and Aditya suggests not to deep fry but toast the bread in a shallow pan,which works out wonderfully I must say.I have not tasted the fried-in-ghee version anyway,so wouldn't be able to compare both. 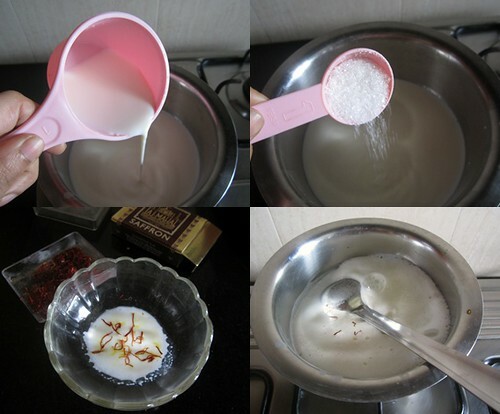 The process is very similar to making Rasmalai or Rabdi but is done in a very quick and easy method.Here's how I made it. In a thick bottomed pan add the milk along with the sugar and let it boil.Once it comes to a rolling boil,remove 1-2 tbsp milk into a bowl and add the saffron strands and let it soak for 2-3 minutes. Meanwhile simmer the milk and keep stirring every now and then. Mix in the soaked saffron strands along with the milk and continue cooking for 10-15 minutes or till the milk turns thick and creamy. Switch off and keep aside. Cut the crusts off the bread and cut into two triangles. In a tawa add the ghee(just enough to coat the pan)and toast the bread.Apply some ghee on the bread too. Toast both sides till brown and crisp and keep aside. 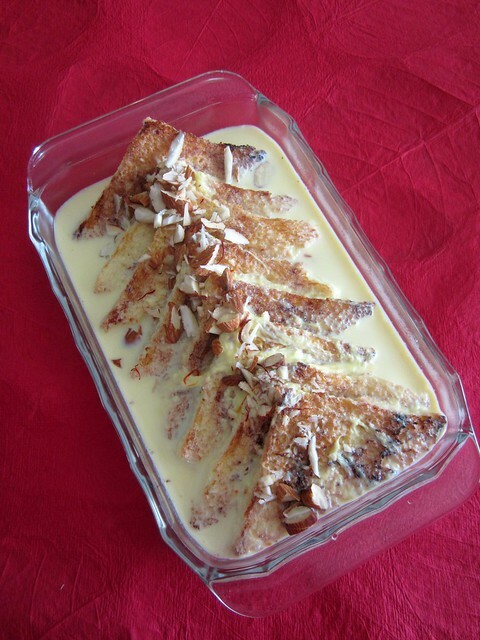 In a serving dish arrange the bread slices and pour the warm milk syrup on top.Garnish with chopped nuts and few saffron strands. Let it stands for a while till the bread soaks up the milk syrup and serve. Verdict - I had to go out on some errands immediately after taking the pictures,so I stashed away the warm Shahi Tukda inside the fridge.When I came back to it after 6 hours,the milk was all soaked up by the bread but at the same time,the bread held on to its shape not becoming soggy.A wonderful sweet dish made really quickly and tastes delicious. I would recommend the book to non-vegetarians as there is ample choice of meat,chicken and seafood dishes.The recipe may look complicated as most of the recipes fill up 2 pages but in fact the detailed method actually walks you through it all.If you are a vegetarian you may find the number of choices not very satisfactory. 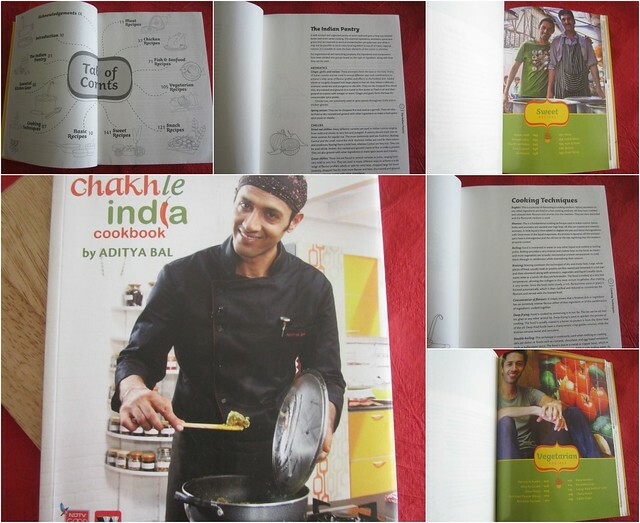 Chakh Le India Cookbook was sent to me by BlogAdda for the Book review Program,if you want to be a part of it too,join here! wow very nice recipe...yum yum! This is so awesome. I made it once and even took pictures to blog about it - but I was taking it to a party and was going to take the final finished picture there - once it was out, everyone dug in and I got a horrible picture - so decided not to post it! Your post and your dish here is making me crave real bad. So much to catch up on your blog - will do it soon. Very nice,I made the fried version last year!! Looks good!! 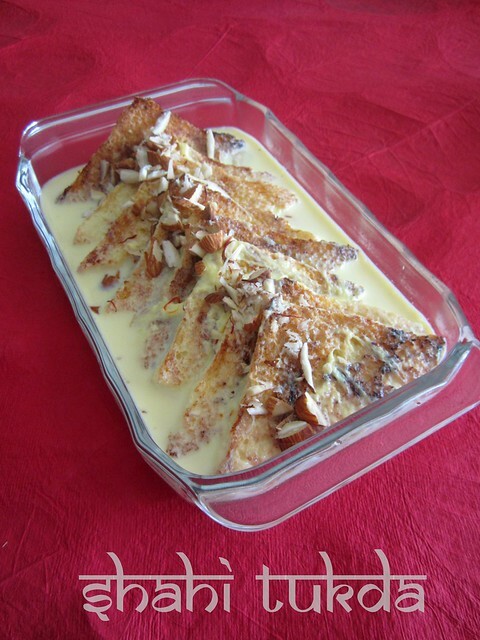 Such an irresistible shahi tukda, droolworthy definitely.. Such a humble and honest review. mmm.... mouth watering dessert. My all time favorite.